Newsbytes – Global Warming Downgraded, James Lovelock Recants | Watts Up With That? Is climate change alarmism slowly coming unravelled at last? I always thought that it would in the end, but I was having doubts about whether I would live long enough to see it. The windmills around our way spend an awful lot of their time not spinning. The Great Walk-back is beginning. Climate chenge is not a problem, it is natural and will continue after man has gone from the planet. Good news! Even though we said two years ago that we needed to act within a year or all is lost, new research indicates we still have time. But we must act THIS YEAR or all is lost!!! In Hebrew there is a saying: Where repenters stand, even the righteous will not. James Lovelock’s letter is a testament to the childish naivety of the environmental movement. He, as a result of a boyhood cycle ride ride through what he saw as an idyllic countryside, built an entire theory of life on Earth. He entirely missed the awful life and working conditions of the average farm labourer in the 1930’s, the low level food production resultant on this ‘idyll’. He may moan about ‘agri-businesses’ despoiling the countryside but ignores the immeasurable benefit they have brought world-wide by the production of cheap food through the Green Revolution of the 1960’s. Now, years later, he looks down from his ivory tower and realises that he might have done things differently. What arrogance. He, as so many in the field, believed that he, and he alone, knew what was best for everyone else. This is still the overarching attitude of environmentalists every where, that they know best, and the rest of us had better keep in line. They are Statists to a man/woman better suited to life in the USSR of the 1950’s. I’m reminded of Monckton’s Christmas post. When “a rat” has abondoned ship because they’ve opened their eyes, let them in in lifeboat. Are they willing to admit all this warming isn’t caused by CO2 yet? There’s been 16 years with no meaningful warming while CO2 has been going up unchecked. Once they realize CO2 is a 3rd-order forcing, there’s no reason to justify even a 3.4F increase in temperature–at least due to CO2. No wonder Gore is preparing his financial life boat. SS CAGW the ship he is captain of has hit the iceberg of reality. While Mann and Hansen are still in the engine room stoking the boilers. Hmmmm, haven’t seen anything about this in the norwegian media. Now, why am I not surprised….. When it comes to climate modeling, the long trends seem to always be more of the most recent 20 year trend and linear extrapolation out 100 years even though the recent history (150 years) is a 30 year ramp, followed by a 30 year plateau with a decline just before the next ramp up. Will we panic about the next ice age when the AMO goes cold in 15 years? There is too much invested in this subject: too much money, power over money, and power over people. To many of the movers and shakers that have their fingers in the pie will ride alarmism into the ground and call for and achieve the public shaming and destruction of anything or anyone in their power who gainsays the great AGW lie. Oh, and you will continue to get to pay for it. Enjoy. I’d just like to share a few reflections on climate change, with reference to my part of NSW, since NSW has recently been used as a poster-child for CAGW. Remember how we were ablaze last week? There are still risks in some parts, but Oz has just done what it does best: it just changed its climate again. I note with all this rain that’s tumbling down that nobody predicted it a couple of weeks back. I certainly did not predict it. Chance of a major flood here over the weekend? I’ll predict it, and if it doesn’t happen I’ll just say I never said it or that my comments have been taken out of context or…but you guys know the drill. Our rainfall records still stand. Now, you would think – would you not? – that the appallingly dry December just past would have been the driest “ever”. Not even close: we had our driest December in 1938. Our wettest was in 1970. Anyone doubting the reality of climate change (ie most people who bang on about Climate Change) should consider how we emerged from the 1890s into that poxy Federation Drought. Our wettest January was in 1895. Our driest was in 1900. But nearly all our worst drought months, like all our worst heat months, lie way back in the past. They don’t tell you that, do they? Oh well, since it’s a matter of public record, maybe they don’t feel they have to. I notice that there’s been talk of 1939, after the smashing of one of those “ever” records recently, in Sydney. Would you believe that in 1939 not one drop of rain fell here in the month of February, supposedly the wettest time of year? Ten years before that we had our wettest month of any on record: in February 1929 a whopping 882.5 mm! Our driest year on record was in 1902. (Sydney’s was 1888). You would think that legendary 1950 would have to have been the wettest, but, in fact, more than two and a quarter metres of rain was dumped on us in 1963. What can I say? Climate change! I am so proud of the sceptical bloggers, scientists, politicians etc. who have stood up against the well funded Great Global Warming Scam. When this fraud ends, let’s hope it serves as a lesson to scientists and the public about the meaninglessness of consensus. The only thing that matters is being right. It was Rahm Emanuel, former Chief-of-Staff for Obama’s first administration that said, You never want a serious crisis to go to waste. For Obama AGW is just a lever to create bigger government. Kudos to Lovelock for finally seeing the light. I live for the day that Micky “Nobel Prize-winner” Mann bows his head in shame for what he has done. Of course, that will also be the day that pigs sprout wings and Hades becomes a place where skating would be possible (if there were any skates). Lovelock is eclectic in his discourse. And so he has not, in the cited letter, backed down scientifically from his claims of scientific certainty in the alarming dangers from fossil fuels. “It is true that we need a better way of producing energy and there is little doubt among scientists, and I speak as one of them, that the buming of fossil fuels is by far the most dangerous source of energy. By using it to power industry, our homes and transport, we are changing the composition of the air in a way that will have profoundly adverse effects on the Earth’s ecology and on ourselves. He ‘a priori” asserts based on claims of scientific certainty that there are alarming ‘dangerous’ effects from burning fossil fuels. I see no sign in his letter of him backing down from his long held claims about the alarming dangers of fossil fuels. Nor do I see him admitting any significant change in his belief that there is a well established consensus about the scientific certainty of the alarming danger of fossil fuels. Again, he is eclectic. So one needs to pick out the various messages separately. Could it be that the alarmists are just lowering the sticker price? I do not mean to insult anyone with my question. I ask it in hopes that someone who has the time and expertise will investigate the several articles and wager an educated guess as to whether the lower number on climate sensitivity is the result of better science. Thanks for that mosomoso, that is the kind of information that everybody should get. Our weather is ordinary and even when it varies it varies in an ordinary way. I like it. Anyone have a 300′ moai banner we could put on a turbine tower? How about totem poles? So true. In short it is time for sane organizations (501s) to start a serious push back campaign. The money is to great and like the toxic paper that circled the globe in 2007 and 08 they have created an artificial market that trades on the stock exchanges (you would think leaders would be smarter than this – trading air for god sake). The ego’s in the scientific arena and academia are to big to simply admit they were wrong. The narcissists (politicians) like the President and many others worldwide would never admit to their stupidity. Imagine any of the famous names standing up and saying I got it wrong (like Leonardo DiC…..) Couple that with the money involved and you will realize they will never in their lifetime admit they made a mistake. This is why we need to counter with TV ads web campaigns etc. changing minds one person at a time. Like the toxic and fake paper (CDs) in 07 and 08 that collapsed the world markets we need to stall and reverse the AGW scam before it balloons further out of control. Clearly our leaders will not so they need to be kicked out of office, honest brokers if possible put in, and ENRON type investigation need to be forced on all of the organizations that propogated this fraud. Media, academia, politicians, and companies a like. They need to return the ill gotten profits back to the people. I mean fair is fair right Mr President. It really isn’t surprising that Lovelock has recanted about CAGW since it is logically inconsistent with his Gaia hypothesis. The Gaia hypothesis posits that the earth is an inherently stable, self-regulating entity which necessarily means that negative feedbacks predominate. CAGW, on the other hand, is premised on Earth’s climate being inherently unstable with positive feedbacks being prevalent. You can believe in one or the other, but only a fool could simultaneously believe in Gaia and CAGW. That “rapid warming in 90ties” was just few tenths of degree from the bottom of Pinatubo cooling to 1997/98 super El Nino, and climatologists happily pulling this line to the year 2100. This is what climatology is doing: prolonging a limited trend 100 years forward. All that “lower sensitivity, 1,9deg C per doubling” trash talk is again just trend wanking, just less steep. Yes Al Gore’s sell out was a major signal that the exodus was about to get underway. If you have stock in Wind or Solar dump it NOW! Whether Obummer actually notices he is at the tail end of line getting off a sinking ship is another story. Lovelock still wants to have his eco-cake and eat it. No, like countless toppled statues of Lenin and Marx, they will be monuments to a failed ideology. Anything we do in the United Kingdom about energy sources is mainly to set a good example before the other nations; if we drew all of our energy from renewable sources it would make only a small change in the total emission of greenhouse gas. But such examples are needed and are something to be proud of. And that ain’t gonna happen because people look at the example set by people like Al Gore and see the hypocrisy. Better still we should look to the French who have wisely chosen nuclear energy as their principal source; a single nuclear power station provides as much as 3200 large wind turbines. I am an environmentalist and founder member of the Greens but I bow my head in shame at the thought that our original good intentions should have been so misunderstood and misapplied. So why didn’t you use your authority and speak out forcefully against the decades long campaign of misinformation and hysteria against nuclear power by the Greens before now? Hmmmm, I think Obama just sees an opportunity to raise taxes, nothing more, nothing less. You then will find out how life in the EUSSR is, because anytime soon you might be living in de USSA. It won’t end. Science has now become the favorite tool of the political elite. Just as the church once swayed enormous power over Europe (in cahoots with Kings and the Gentry). Like religion, the high priests of science can speak categorically and with unquestioned authority. If the political elite don’t like what the latest science priests are saying then they will dump them and find another fool. Peter Gleicks, James Hansens and Michael Manns abound and these new high priests are ready to tell the public “in the name and authority of science” whatever the elite want to hear in exchange for a few scraps of kudos, power and wealth. I am sorry my friend but these are the beginnings of very dark ages. When I read the “Climategate” e-mails I didn`t think there was an honest scientist among them. They came across as little more than a group of manipulators, conspitrators and yes even thugs. Maybe I was wrong as now it seems a few has seen the evil in their plot. Although it was done as satire who can ever forget George Carlin`s warning who these people were in his “Saving the Planet” piece. Excuse my spelling it should be conspirators. Jimbo, I was thinking of “The scarlet Letter”, but the “A” stands for “alarmist”. These ashamed individuals should be made to wear it everywhere, everyday. …..I am sorry my friend but these are the beginnings of very dark ages. Science was the daughter of the Age of Enlightenment and so was the US Constitution and the golden age of the USA. Now we are dealing with the Age of “Counter-Enlightenment” or “ANTI-Enlightenment” One branch of the “ANTI-Enlightenment” is Secular Humanism. Who were some well known Secular Humanists? Long but well worth the read. That’s consistent with the first wind farm in the US–located in Hawaii. I understand there’s a big legal battle over ownership: Not about who gets the procedes from the electricity, but who’s responsible for the multi-million dollar price tag to clean up the “boneyard” it has become. If it were mere totem poles, the locals could turn this defunct wind farm into a tourist trap and at least delay the horrendously expensive reclamation, but that’s not going to happen. Welcome to wind turbine boneyard USA! You would think that the alarmists would be rejoicing in the streets at the realization that heat doom is not upon us, but they cling to their panic and fear-mongery like limpets to a rock. Oh my goodness, she is naive! She really thinks the Warmistas care about facts! Thanks a lot, Phil, thanks a lot, James. Lovelock surely has sold so many alarmist books he can buy himself a cruiser. He’s a lifelong alarmist and rent seeker. Well they could use them as fans on still hot days, and in reverse to reduce a gale force winds! Would anyone care to place a small bet on whether or not a specific wind turbine (excepting of course turbines which are maintained for personal ego or public relation purposes) will continue spinning for even a year after it no longer gets any preferential economic treatment? After it stops spinning, how long will it take for the materials to be recycled? Of course it may only be by the urban recyclers that helpfully remove copper pipes and wiring from homes under construction, but I doubt that they will continue to stand for very long unless local authorities take special effort, such as tax preferences, to protect them. It may not be cost effective to recycle the massive foundations, but they would probably make a wonderful foundation for a cottage with a scenic view. I simply cannot imagine that they would survive for even a few decades – much less the length of the Easter Island statues. While they do stand, I would hope that they will be a vivid reminder to investors that business decisions should be based on economic reasons rather than the whim of ignorant or pandering politicians. I think we should welcome James Lovelock’s recantation. “There’s more joy in heaven over one sinner who repents than over ninety-nine just persons who need no repentance”, or something. I’m quite in favour of the environment myself and I’m sure that we should minimise pollution and wastage of resources. The shame is, many “Greens” who share that opinion assume that they also have to buy into the whole Orthodoxy including cAGW, otherwise they won’t be accepted as True Believers. I love the Easter Island comparison, but unfortunately wind turdbines need a lot of maintenance and will only last a small fraction of the 700 years the moai statues have stood. Best place for them. At least that way they’ll go down with the ship. And good riddance. A rightful end after all the bilge they’ve been coming out with for the last 20 years. The High Priests of ancient Egypt told the people when to plant the crops, just before the Nile flooded. They were deemed all wise because they were usually right,, they observed that when Sirius was first visible the floods followed. They built the pyramids to worship Sirius who “caused” the floods. The ancient Chinese used to bang gongs during a solar eclipse, because they thought that the Sun was being eaten by a dragon, of course the dragon was frightened and stopped eating the Sun! I think that these are strong analoies with CO2 causing climate change! This could be Obamas next AGW/CC speech! with apologies to Winston S Churchill! Jack Mclaughlin says “… now it seems a few [climate scientists have] seen the evil in their plot. “. ‘Fraid not. Nothing has changed jn climate “science”. They are still attributing all temperature change to CO2. The only thing that has changed is that the last decade’s temperatures have forced some of them to lower the value that they can claim for climate sensitivity. It’s still as high as they can make it, and they still refuse to do any real science. Lovelock I thought was once a very respected scientist, especially his role in developing extremely sensitive scientific equipment. I recall reading his Gaia hypothesis not long after he published it. It seemed to me an extremely useful simile (not hypothesis) and pointed to many other avenues of scientific discourse worth pursuing. Lovelock now? Having read the above, Lance Armstrong is the simile that comes to mind. Why I do I feel the need to wash my hands and breath with my teeth closed? That is an awesome saying. I could have used it to great effect in a discussion I had at dinner last night, if I had only known it. It might come as a surprise to those readers of this BLOG who are used to seeing my rants against Marxism, but I really am an environmentalist. In fact it is because of this that I hate Marxist thought so much. Anyway, from my perspective, Lovelock’s Gaia theory is completely antithetical to the doom prophesied by the high priests of ecological catastrophe. Kev-in-Uk: Your mention of Obama and Churchill in the same breath makes me want to retch. You have captured Obama’s goals admirably, but even were he to state them honestly, neither Obama nor his legion of spin-masters could ever approach the quality of Churchill’s prose. Vice President Biden, on the other hand, is a prime candidate to re-cast Sir Winston’s speech and make it his own. He has a history of “borrowing” from others. See here . So what becomes of these new estimates if the steady state temps continue for another 5 years? Apparently they will have to downgrade their estimates even more,right? Every little bit like this helps. After a while critical mass and increasing momentum gather such force that they all will have to fall in line. And then the real work will be ahead. Setting up mental health clinics to counsel those suffering from cognitive dissonance. They are Statists to a man/woman better suited to life in the USSR of the 1950′s. As an ordinary citizen or a member of the Politburo? That would be 3 MW turbines all producing at their peak. If we go for the best average it is 10,000. And if we go with the net (spinning reserves accounted for) it is 160,000 at best. At January 26, 2013 at 1:59 pm I dropped a decimal point. 3200 is correct for average production and 16,000 would be net. Look at the comment from the university of Oslo. In the past “scientists” have been telling us they calculated the sensitivity of the earth including feedback factors. They also claimed that they knew the sources of natural variation and the rise being observed was well outside those limits so it had to be due to CO2 – there was no other possible factor. Remember the claims of positive feedback from water vapour, the hot spot in the middle troposphere, the change to less low cloud and more high cloud etc. This is an admission they simply used the claimed rate of temperature rise, assumed it was all due to rising CO2 (without really having any idea about natural variations their sources or magnitudes) and from that extrapolated an effect 100 years out. This is a total reversal of what they claimed in the past. They are now conceding that natural variation is at least as large as the impact of CO2 (since it supposedly has cancelled out warming for the last 16 years) but since they have now also admitted they don’t know anything about natural variation and its sources maybe they are still out by a factor of 2 and both the rise 1970 to 1998 plus the stasis 1998 to 2013 are due to natural variation. This revelation is an admission that the entire scenario, claimed as detailed and reliable science, was simply an extrapolation of short term dodgy data coupled with a totally unwarranted assumption that CO2 was the only significant driver of climate. Their 2 half data sets (1970-1998 and 1998-2013) conflict massively with that assumption since one shows warming and the other doesn’t yet CO2 is rising for both yet still they cling to the assumption. Actually this is disappointing. All they have really done is curve fitting the model to include the last decade. They should be using the period prior to 2001 to calibrate their models, and then test them again using the full period thru today. Since the models cannot explain the current period that is a clear indication that fundamental variables or interactions are not included. There are a number of alternative mechanism that have been suggested and poo-poo’ed by the climate change establishment, maybe it is time to finally test some of them by incorporating them into the models and see what happens. Just a wild guess, but is there a wind farm planned neat Mr Lovelock’s home? I look at Obama’s speech a little differently than most. To me it sounded like a ploy to keep the useful idiots invested while his rich buddies bail out of the scam. As soon as these 1%ers have all enriched themselves even further I expect Obama to pull the plug and move on to the next scam. I’m with Nick Luke. Lovelock and his ilk just have simple unsophisticated thoughts – nice but they don’t help humanity improve much.These people think that what they saw as a child is how it should always remain. There is no actual rationale for this. If mankind makes things better – and we has in a lot of ways – why would you like to keep things the way they were. He now recognizes something many of us have known for may years – centralized large scale power generation is really the only way to go. He touched on one other thing, that being the increasing human population of which he is one. This is nothing to do with recanting.. It is to do with a selfish greenie hypocrit not wanting a wind turbine “in his backyard” !! I have actually read Lovelock’s book on the Gaia Hypothesis. It is a far more sensible book than any description of it that I have ever read. In fact, it is a very interesting book and I heartily recommend it to the people of this website. agreed – hence the apologies statement/caveat! You know, sometimes I get really depressed thinking about just how fecked we are in the the hands of the morons we generally call ‘politicians’. And you know what annoys me the most? – it’s the fact that most really ordinary genuine people could be far better politicians if only they would stand up! Why are politicians so gawdamned corrupt? History shows that no country, no matter how great, ne can avoid the devastating impact of DEBT. Generations of children in the US are effectively being sold into slavery by current US economic policies. Climate change pales in comparison. Lovelock recants.. AGAIN?? I was sure he did this some time ago already. Combine the recanting by the Met office announcing on the sly(Christmas) that there had been no warming for 16 years and it should be game-over for the AGW theory. It takes just ONE significant discrepancy in the data, model or methodology for a theory to be discredited . There is much more than money continuing the Big Lie. There is the more important issue that carbon taxes will eventually destroy the industry and economies of western nations. In Australia, 10 % of ETS monies go to the United Nations, the biggest proponents of the scam via the IPCC. But what would possess the UN to lie so? For the answer, we must return to the impetus to form the progenitor of the UN, the League of Nations. It was the Fabian Society, a bunch of Socialists with some truly crazy ideals which were/are as crazy as the Nazis. Some of the UN resolutions signed by YOUR governments eg Agenda 21 and UNIDO(aka Lima Declaration) in particular are straight out of these Fabian Utopian ideals. Realistically, James Lovelock MUST get that message out continuously and broadly to the media across the globe, perhaps with a worldwide tour. He let out the original genie, which has now run amok, so he must lay the genie to rest. I would absolutely LOVE him to come out to Australia to recant. Nick Luke has it bang on. Surely he has not recanted he has said that what he was aiming for has be subverted and abused. For more information please go to my website. I am not a scientist. What got my alarm bells ringing was when they started saying, “the debate is over”. Once the atmosphere of the culture of the movement turns absolutist and fundamentalist, you’ve lost the “self correction” so key to science, and the basis for trusting that science. The flat temps might not have happened for other unknown reasons, we could have kept warming for other unknown reasons, and that would have self-confirmed their beliefs. Josh needs to create some cartoons showing the Easter Island heads with the now missing wind turbines on top and the demise of the Island civilization. Perhaps “propeller” caps. I’m still confused as to the ‘sensitivity’ of 2X CO2. Since it is acknowledged to be logarithmic and currently we are roughly 40% of the way to a doubling of CO2 from 280ppm. Doesn’t that mean that we have seen roughly 60% of the effect at present? If the IPCC is predicting a 3.5C (6.3F) rise for a 2X CO2, doesn’t that mean that temps should be around 2.5F higher now than they were at 280ppm, yet current temps are only roughly 1F higher than they were at 280ppm? How do they explain that? Moderator, the link to Pat Ravasio’s site still works and she still uses the d words. Their constant “We’re running out of time” has run out of time – they’re looking for an extension. Saying it’s not as bad won’t stop them insisting that something must be done. Lovelock is still very much in the warmist camp – in spite of this being in opposition to his self-regulating gaia theory which would demand the feedbacks be generally negative. However, he does have sensible views on windfarms lack of utility, as well as the utility of both nuclear and fracking in providing energy with little of the carbon dioxide emissions that he views as being a problem. It’ll be interesting to see how the MSM juggles this hot potato. Signs of commonsense being introduced into the warmist side of the science debate. mosomoso, Australia stretches from latitude 10 S to 45 S. The climate on this continent varies from tropical rainforests to deserts and alpine snowfields. Two years after Queensland suffered devastating floods it’s happening again. That storm front is moving down to NSW. Meanwhile further south here in Victoria, The Prime Minister is visiting areas in Victoria where bushfires still burn. These extreme events are happening with increasing frequency. The common factor in the extreme conditions is heat. Temperature records were broken across the continent a few weeks ago. In the tropics extra heat increases evaporation of the oceans and drives cyclonic winds. That is what is happening in Queensland this year, as it did two yaers ago. What were once in a century events are happening with greater frequency. That is climate change. You are looking at a too short period of the Earth history. NO Climate change that wasn’t predicted in 1899 to be happening within the next 120 years. Remember John Muir. His heart was broken because he could not save the other Yosemite Valley (Hetch Hetchy). It was dammed for water for San Francisco. The Sierra Club always used to try to protect the environment from those who wanted the resources. It’s rather ironic that they now let renewable resources trump environment. Windmills are not green. The panic over saving the world causes people to lose their reason. Philip Shehan I have a brilliant solution to your problem. Granted that Australia seems to be taking strain from the heat, and the devastating droughts and floods of the 18th and 19th centuries have reappeared, we round up all the whingeing Aussies and relocate them north of latitude 60 in places like Canada and Siberia where bush fires are unknown and the population density is only a tenth of the global average thanks to extreme cold making the region close to uninhabitable, but global warming will fix that. Australia has a third of a per cent of the world’s population, and nutty climate activists are only a fraction of a per cent of that. The notion that this handful should attempt to promote their special needs over those of the remaining 7 billion humans and countless billion other animals, is simply laughable. BTW I spent a few years in Oz and apart from southern Africa it’s as close to “God’s Own Country” as you can get and the people, most of them anyway, are fantastic. PS Philip when you have been “raptured” to a climate better suited to your liking, please leave your house for all the perfectly satisfied Aussies to move into, and make sure the fridge is full of frosties too. I like the climate here fine as it is. My concern is that future generations of Australians may find the results of anthropogenic climate change on this continent far less amenable. Dear Philip, may I repeat in simple words what I said before. Australia seems to be getting too hot for some of its population of 23 million. But a warmer planet would be welcomed by not millions but billions who live at high latitudes. Nevertheless that tiny percentage of the world’s population comprised of Australian climate activists insist that the whole world take action to cool Australia down. Is this or is it not a logical disconnect? Disregard Shehan, his mind is made up and closed tighter than a drum. He parrots the usual alarmist lie: “These extreme events are happening with increasing frequency.” That is mendacious propaganda. That is contradicted by reams of empirical data. The climate Null Hypothesis, which has never been falsified, shows unequivocally that current climate parameters have been routinely exceeded in the past. Therefore, what is happening now is neither unprecedented nor unusual — despite what prevaricators like Shehan falsely claim. When actual scientific evidence is used, the conclusion is that nothing unusual is occurring. And as a matter of scientific fact, the past century and a half have been an exceedingly beneficial time for humanity and the biosphere, despite what mendacious propagandists assert. To suggest that “Australian climate activists” are the only people on the planet to understand the consequences of anthropogenic global warming for populations and economies all over the world is nonsense. I am an Australian but not a climate activist. I am a scientist and therefore a professional skeptic who was persuaded on the basis of mounting evidence that AGW is real and constitutes a major problem. Your attitude that because some may see a benefit in changing conditions they should have no concerns for how this adversely affects others certainly contains no element of logical disconnect whatsoever. It is merely a demonstration of one of the more regretable sides of human nature. and added a host of irrelevant camouflage, in particular the horizontal yellow line at 9 on the y-scale, to flatten the plot in order to try to claim that the temperature was “unequivocally” fitted by a straight line. Philip Shehan – re the AMTI graph you posted – what is it a graph of? Looks like it contains some model output, not just temperature measurements. Pls can you find out and report back. 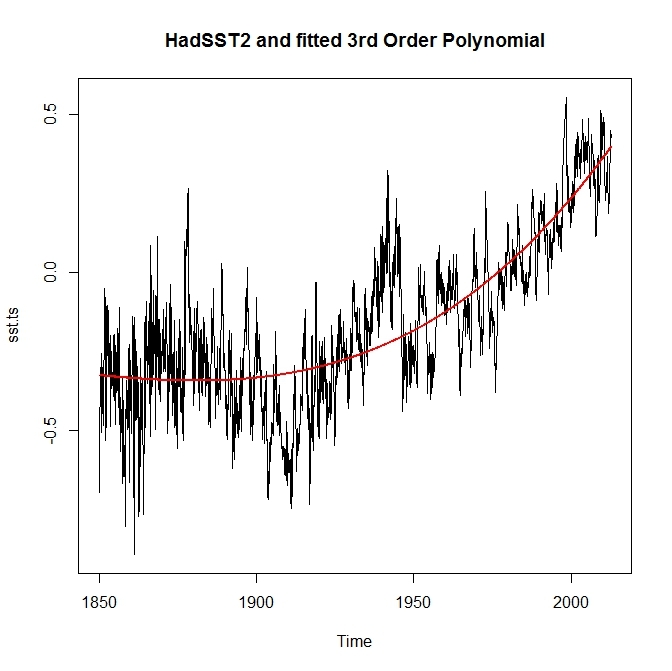 The temperature data is fitted by an iterative program to a non linear function producing the best fit curve shown with a correlation coefficient r2 of 0.8412. This is no different to the fitting of temperature data to a straight line commonly used for multidecadel data. Given the noisy nature of temperature data for short periods, a linear approximation is the best that can be hoped for. There is no reason to assume temperature data should match a straight line, and clearly for data going back centuries and millennia it does not. My only complaint about Way’s graph is that he neglects to tell us what function he has used, although it looks like a second order polynomial or exponential function. And at the beginning of this month, Mark Lynas gave his Mea Culpa on his opposition to GM (genetically modified) foods. Is common sense beginning to break out? DB Stealey has introduced a wrongly labeled graph in his 7:18 am post. Figure 1: The y axis is the real average annual number of extreme weather events per year by decade and shows an exponential rise over the century, exactly as the “mendacious propaganda” says. Figure 2: The y-axis is the number of deaths and death rates for these events. you on the other hand show lack of basic knowledge in Science theory in regards of using two graphs that aren’t shown to be related, and isn’t, Please read Huff’s How to lie with statistics. There is same type of unscientific usage of graphs that can’t be used to be used to present a conclusion. But that’s worse than that. You haven’t analysed the figures behind the graphs. If they aren’t correct, [then] your ‘conclusion’ falls no matter what. Tropical storm 1, Tropical storm 2, San Zacarias Hurricane, Hurricane four and Hurricane five. Tropical storm One, Hurricane Two, Hurricane Three, Hurricane Four, Tropical Storm Five, Tropical Storm Six not to mention the Tropical depressions. Do I need to proceed? And that was only in the Western Atlantic…..
His honest assessment of his heretofore poor understanding of the issue continues for almost 5,000 words—and it’s a must-read for anyone who has ever hesitated over conventional produce. To vilify GMOs is to be as anti-science as climate-change [D word excised to avoid the snip], he says. Yes you do need to explain further. Stealey claims (D.B. Stealey says: January 28, 2013 at 7:18 am) that I am parroting an alarmist lie that extreme weather events are increasing, and that this mendacious propaganda is contradicted by this graph which he claims is a plot of the average number of extreme weather events per year for each decade since the 1900s. The problem is that it shows nothing of the sort, as demonstrated by looking at the actual paper. 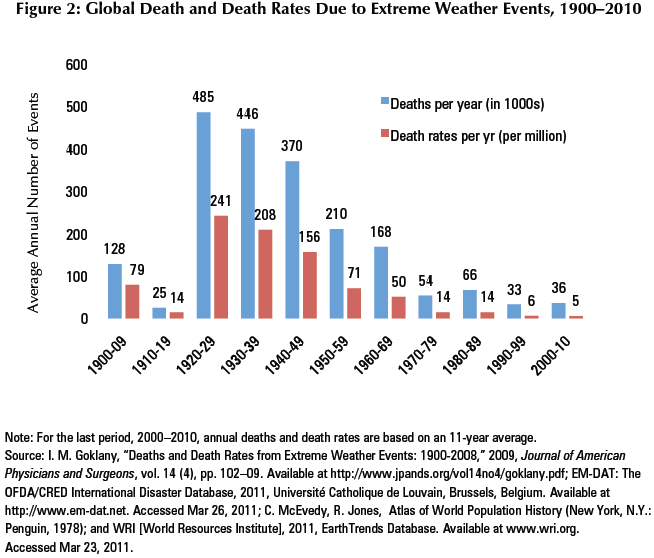 It is Figure 1 which shows the number of extreme weather events, which is what Stealey is talking about. And completely contradict his assertions. the EM-DAT database for each “decade” since the 1900s. If you have a problem with the data in the paper or these Figures, take it up with the author, or in the case of Figure 2, with Stealey who accepts it at face value while failing to understand what it is actually showing. And I do not claim the graphs are related. That is not the point. The point is that if Stealey wants to use data and graphs to hurl abuse, he had better make sure he has got it right. In this case he is using the wrong Figure. The right Figure totally contradicts his case. I am a scientist with a PhD, over three decades of research experience with additional post graduate qualifications in the history of science and the nature of scientific knowledge. What exactly qualifies you to lecture me about my alleged lack of basic knowledge in science theory? My background in these type of science discussions goes back 40 years when last I had to educate those who should have known better in the Academic world trying to imply same as you. One of the worst fallacies in Theories of science is someone trying to use a title, academic or not, as a proof of knowing better…. I started of as a systemprogrammer in 1971 after studying Math and Mathematic Statistic before. Later on I studied other things side by working full time and during the 70’s also being active in the Liberal Party’s youth as well as in the mother party’s regional group here in a town close to Gothenburg. One of the things I did then was ‘introducing’ Humanecology here in Sweden side by three friends of mine. The systemprogrammer knowledge I use in 1992-93 due to having to establish correct waterlevels in open Sea (Atlantic) from peak Stone Age to 1000 AD. That was needed in order to have correct facts for landrise as well which had affected what we today call the Baltic Sea. I needed the correct information in order to do what I had to do analysing the Waterways from the Baltic Sea to Lake Roxen, close to Linköping eastern Sweden. I used 43 different variables from nature. More than 20 of the most essential premisses needed to be correctly confirmed never ever been used in any of the so called datamodels of today. I wouldn’t have tried to do such a bad program as everyone in that field done. I participated as a nine year old for the first time in biological and chemical sampling together with sampling of temperatures close to ground, 1 resp 3 meters up when groundlevel was land completed with down in water when ground was water. My father was one of the first to work full time with the air and waterproblem including all from emissions to air and water such as gases and pollution. I participated at least once a year several years after I had moved to Gothenburg, where I was born, in 1971. There aren’t many documents, studies and dissertations in this field I haven’t read over the years. No matter if written in English, Swedish, German, French, Norwegian, Danish or Dutch. Later on in life when studying for the third time I became teacher of History, Geography, Religion and Social Studies. Forgot to tell you that I have had to study Theories of Science in seven academic courses. I am known to eat those who forget what they should have learnt re. Theories of Science for breakfast…..
Shehan is either deluded or thoroughly dishonest. I suspect the latter, because shehan continues to post a fabricated chart with no provenance, which purportedly shows rapidly accelerating global warming. This is my only real issue with Shehan: he is deliberately lying about accelerating global warming, which has, in fact, stopped for the past 10 years despite the continued rise in harmless and beneficial CO2. If Shehan has a problem with Dr Goklany’s thorough analysis, he needs to take it up with the author. Impotently sniping at Dr Goklany here shows that Shehan is afraid to engage with the original expert source. There are mountains of verifiable data showing that there has been no acceleration of global warming. Shehan feels compelled to lie about it, because if he admitted the truth his entire argument would collapse. If Shehan simply admitted the truth — that global warming is not accelerating — I would leave him alone in his alarmist delusion. But liars need to be called to account. Shehan tries to discredit Dr Goklany’s chart showing that extreme weather events have been steadily declining. But looking at Dr Goklany’s original article, we see that Shehan is once again wrong. As shown in numerous other charts, severe weather is declining. Anyone is qualified to point out that Shehan is lying about global warming accelerating. It doesn’t take a PhD to expose dishonesty. No it doesn’t….. but he also forgot that experience in discussing these questions and “eating” so called experts last time they tried back in late 70’s to present same non-valid arguments, is better than studying something up to Ph.D without learning by heart…. At January 29, 2013 at 4:53 am you ask Inger E.
As an interested observer, let me give you an answer. It is not relevant what you or she states as being academic qualifications in the matter (although I note that she claims superior qualifications to those you claim). Competence in knowledge of science is all that matters. Inger E is qualified to lecture you on your ignorance of basic knowledge in science theory because she – like me – observes it in your posts on WUWT, and she has provided you with the correct interpretation of the information which you provided in this thread but failed to understand. The point here is not knowledge of science. It is of simple comprehension. Are you all so wilfully deluded that you cannot understand the very simple point here? The correct graph of the frequency of extreme weather events is Figure 1, and it shows the opposite of what Stealey asserts. If you wish to argue that Goklany has got it wrong go ahead. That is not the point. The point is that Stealey’s argument (and personal attack on me) is based on his use of the wrong graph. I ask you all a direct question. Which graph shows the number of extreme weather events, Figure 1 or Figure 2? Doesn’t matter if you or someone else use what you think to be logic graphs. If the facts behind the graph, any of the graphs you refer to, aren’t correct, then your argument falls. Doesn’t matter how many non-correct, faked or ‘only’ corrected figures used in a graph. ** If the figures involved in an science-paper, essay or diss., isn’t correct, then the graph is incorrect. Had the figures involved been correct, you still wouldn’t have been able to use it to prove it’self. under condition that C->D that it’s even likely that A ->D in any specific relevant analyse at all! ** Buy or borrow Huff’s How to lie with statistics. You need to read it by heart. Your cv is very impressive. However, let me specifically point out your failure to understand the graph you are commenting on. Contrary to Stealey’s assertions it is you not me who wants to argue the accuracy of Goklany’s data. That’s fine buy me. I am not here to critique his paper, only to make sure it is quoted correctly. Just so we are quite clear here, the number three refers to the annual number of events. For the entire decade you must multiply by 10. The number of events according to the graph for 1910-1919 is 30. It’s that comprehension thing again. Excuse me but it is 9:14 am here in Melbourne. Breakfast time. Shehan might want to ask himself why everyone else disagrees with him. William of Ockham would say the obvious answer is that Shehan is simply wrong. Shehan quibbles about one graph, so here is another that shows the same decline in extreme weather events. 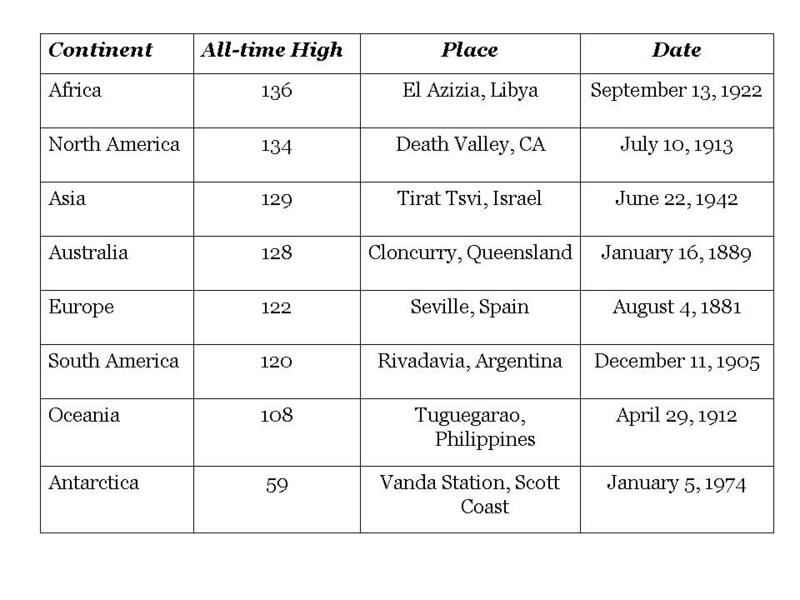 There are many other records that show past climate extremes were more severe than anything currently observed. Finally, I don’t give a hoot about Shehan’s wild-eyed alarmist belief system. The only thing I am concerned with is Shehan’s misrepresentation, falsely alleging that global warming continues to accelerate. I don’t understand why he is promoting that lie, but as long as he does, I will follow up and point out that all the empirical data available shows that to be flat untrue. Keeping it simple for the slow learners. If IngerE wants to argue that Goklany has it wrong and Stealey wishes to defend him, go right ahead. All of Stealey’s bluster and and irrelevant comment by others cannot hide this fact: He based one of his typically abusive comments on the wrong graph. Bolkany claims via Figure 1 that extreme weather events have increased sharply over the century. Bolkany claims via Figure 2 that since the 1920’s there has been a sharp decline are far fewer deaths from extreme events. There is nothing contradictory in these arguments, but Stealey cannot use the graph about death rates to hurl abuse about the number of events when the correct graph contradicts his abusive argument. The one who said it – is it. Slow learner is any person who can’t accept that real facts are hardware and all others aren’t possible to ‘wear’ at all in Science discussion….. Pardon me. The author of the paper is Indur M Goklany, not Bolkany. Of course, it is Shehan who is the slow learner. As I have repeatedly stated, my only concern is that Shehan is publicly lying about accelerating global warming, which is certainly not occurring. All the peripheral isues raised by Shehan are intended to steer the debate away from his “accelerating global warming” dishonesty. I do not care about those side issues. As long as Shehan continues to lie about global warming ‘accelerating’, I will post scientific evidence showing that it isn’t true. It does not concern me why Shehan is lying. Liars lie; that’s what they do. My only concern is that he is lying when he says that global warming is accelerating. Global warming is natural — not man-made — and it has been decelerating [the declining green trend line]. Furthermore, for the past decade, global warming has stopped. Even James Hansen now acknowledges that scientific fact. Stealey is amazing. He accuses me of lying about the temperature record then produces a doctored graph to disguise the truth. He is at it again, camouflaging the truth with this one using the same tactic – adding completely meaningless lines to compress the data, effectively forcing people to squint at the temperature data through a demagnifying glass. He takes temperature hadcrut3 temperature data and descales it by a factor of 100,000 and offsets it by 1.5 and -1.5. What possible justification is there for this? There is none. It just squashes the temperature data in the vertical axis. Here is what happens when you remove these spurious lines. Now we are left with the real data, and even Stealey does not want to attempt to claim that the data is “unequivocally” fitted by a straight line. Thus the layers of camouflage. Here is the average temperature data from 10 sets for this period fitted with an accelerating line. The superiority of the fit is obvious, which is why Stealey goes nuts about it. Having read your several posts on WUWT, William of Occam would not agree that is the reason your post is “simple”. Let us recap for your benefit. You claimed a graph showed something. Inger E disputed that the graph showed what you claimed because – she said – the data presented in the graph was incorrect. You replied that you knew more about the theory of science than her so you must be right. Several people (including Inger E and me) said your reply was laughable. it is you not me who wants to argue the accuracy of Goklany’s data. That’s fine buy me. I am not here to critique his paper, only to make sure it is quoted correctly. You presented the graph so the “argument” in this forum is yours: you chose to present that graph in support of your “argument”. It is a falsehood to claim the “argument” is not yours but is the “argument” of Goklany or anybody else. Throughout, and for the benefit of onlookers, D B Stealey repeatedly pointed out that your history on WUWT consists of peddling blatant nonsense as being information. Whether you or Inger E is right about the graph which you have provided here, your arrogance has defeated your assertions. I hope I have managed to keep that simple enough for you. You have disrupted 3 previous WUWT threads by using a misleading graph concocted by SkS in your attempt to pretend that global warming is accelerating. At January 30, 2013 at 1:05 am you have repeated that same method to pretend the same falsehood. Contrary to your falsehood, there has been no discernible (at 95% confidence) global warming for 16+ years. And lack of discernible warming (at 95% confidence) for a time of 15 or more years is important. According to the falsification criterion set by NOAA in 2008, the climate models are falsified by the recent period of 16+ years of (at 95% confidence) zero global temperature trend. This is because NOAA says the climate models simulations often show periods of 10 years when global temperature trends are zero or negative but the simulations rule out near zero trends in global temperature for periods of 15 years. What the models “rule out” nature has done. The climate models are falsified: this contradicts your superstitious belief in AGW, and you need to come to terms with it. 1. Are you saying that Figures 1 and 2 in the paper do not show what I “claim” they show? 2. Inger E got the numbers in Figure 1 wrong by a factor of 10. Then proceeds to lecture me at length on the proper use of scientific data. 3. Inger E said I did not know about basic science. I contradicted that claim. 4. Inger E’s, Stealey’s and your own sense of humour are not entireley relevent. 5. “I am not here to critique his paper, only to make sure it is quoted correctly.” Correct. Stealey used the wrong graph to abuse me, Inger E got the data wrong by a factor of 10. “If Shehan has a problem with Dr Goklany’s thorough analysis, he needs to take it up with the author. Impotently sniping at Dr Goklany here shows that Shehan is afraid to engage with the original expert source.” Let them sort that out. 8. Stealey presented the graph. The wrong one actually. I corrected him by presenting the right graph. 9. I have shown conclusively here how Stealey goes to a lot of effort to manipulate the data in order to mislead people. 10. My arrogance and your evident humility are not the issue. What is misleading or “concocted” about this graph? How do the concoctions compare with Stealey’s efforts? Shehan keeps posting that bogus SkS chart [the last link in his comment]. That chart is based on a lie. It has no provenance. It is a fabricated bit of pseudo-scientific nonsense. This chart [and many similar charts that have been posted here] flatly contradicts it. They cannot both be correct. Shehan simply is lying with a bogus chart. Shehan’s argument fails because it is based on dishonesty: there is no acceleration of global warming. While it is amusing watching him furiously tap-dance around the issue, it is telling that Shehan avoids the fact that no one agrees with his “accelerating” nonsense. Not even those on his side. It is an ugly fact of human nature that once some folks buy into a lie, they own that lie, and they will keep repeating the lie no matter how much empirical evidence debunks their false narrative. All Shehan needs to do is to admit that global warming is not accelerating. But he will not admit it because he is a liar, and he will own his lie no matter what the scientific facts are. you have replied to me with your post at January 30, 2013 at 12:03 pm. I am now providing a complete response to your reply to me. I wholeheartedly concur with the post addressed to you from D.B. Stealey at January 30, 2013 at 12:21 pm. You can concur all you like but neither you nor Stealey has offfered one scintilla of explanation as to why this chart is “bogus” or concocted. The reason is you cannot. It is simply a graph of temperature with an overlaying curve fit. D. B. Stealey and I have each repeatedly told you that the fitted curve is bogus because it has no basis in reality: it does NOT represent ANY known physical mechanism. It is added to the graph of the data with the sole purpose of misleading by giving a false impression that global warming is accelerating. In reality there has been DEceleration (n.b. NOT acceleration) of global warming such that global warming has reduced to be undetectable (at 95% confidence) over the last 16 years. The last time I tried to stop you selling that nonsense I got given a ‘time out’ from WUWT for copying previous posts. Hence, I cannot copy from another thread one of the several refutations of the fabricated nonsense which is your so-called graph. The graph is a lie which you have peddled on 3 previous WUWT threads and it was refuted on each of them. You are providing another lie by trying to claim that it has not been refuted as being the lie which you know it to be. Shehan is lying again. I have repeatedly posted this chart covering the same time frame as Shehan’s bogus chart, with an automatically generated trend line [the decelerating green line]. Shehan’s fake chart, OTOH, merely has a fake red curve drawn in. Once again, that chart has no provenance. It is not peer reviewed, and that fake trend curve is not based on empirical evidence. And this chart, which Shehan mendaciously claims as his own, is one I have posted for the past year here. 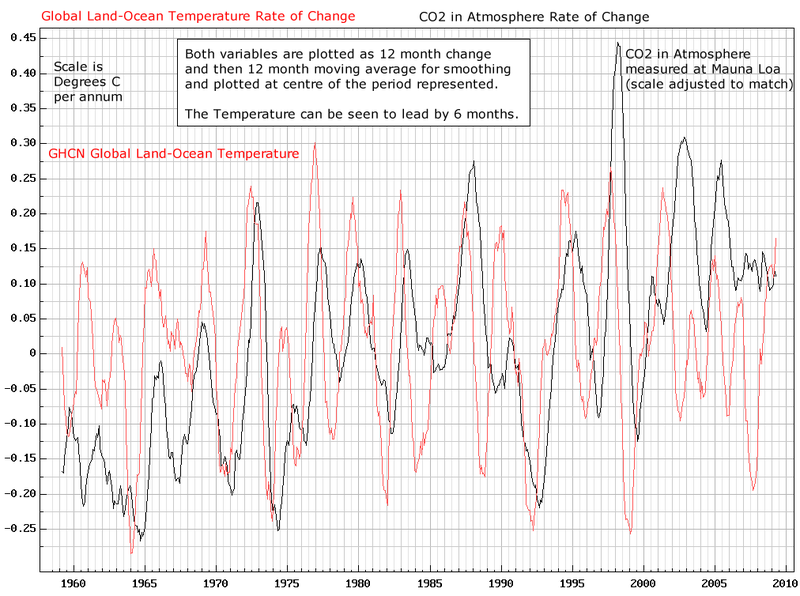 Both charts show conclusively that there is no acceleration of global warming. Shehan lies like a child caught with chocolate all over his face, denying that he stole the candy bar. Now he is using the charts I previously posted, which absolutely falsify his bogus claim of “accelerating” global warming. Aside from that one fake SkS chart, nothing — and no one on either side, except for Shehan — accepts that global warming is “accelerating”. Not even Hansen or Lovelock. Shehan is trying to make issues of anything and everything else, because he simply does not have the facts on his side: There is no global warming at present, and certainly no “accelerated” warming. I request that Shehan cease his “Big Lie” about that particular false claim. The rest of his mendacious nonsense does not concern me. 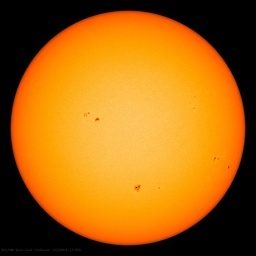 Only Shehan’s lie that he continues to falsely perpetuate — claiming that global warming is “accelerating” — concerns me. Stop lying about it, Shehan. It is not true, and you know it. I’m sorry. I did not realise your graphs had appeared in the peer reviewed literature. and added a host of irrelevant camouflage, most ludicrously by taking the Hadcrut3 temperature data, descaling it by a factor of 100,000 so that it appears as a horizontal straight line and offsetting it way down from the real data at 9 on the Y-scale. What possible reason could there be for this treatment? To flatten the plot in the vertical direction compress the data, effectively forcing people to squint at the temperature data through a demagnifying glass so that you can claim that the temperature data is “unequivocally” fitted by the green straight line. Astonishingly, you state that I claim this graph as my own. I would not touch it with a barge pole. This piece of complete nonsense is all your own work and you have refused over and over again my request to the evident subterfuge. You try it again on this thread, this time taking the fit back to 1850 but using the same tactics for the same purpose, only this time claiming that the green straight line shows deceleration. I present the data and line with the camouflage removed and add straight lines for the first and last 50 years. Decelerating? I don’t think so. You have offered no theoretical basis for your straight line fit (I will accept a practical explanation – it’s the only fit WFT offers.) OK for short term trends, manifestly inadequate for temperature data over centuries and millenia. The fact is that neither you or I are obliged to give any theoretical reason for thchoice of function. The purpose of the fit is simply to see how well such a function matches the data. “The temperature data is fitted by an iterative program to a non linear function producing the best fit curve shown with a correlation coefficient r2 of 0.8412. Per the Scientific Method, the onus is on the one proposing a conjecture — and your [dishonest] conjecture is that global warming is “accelerating”. It is not, as everyone but you will admit. I note that, as usual, you are arguing with everyone else, and that you are all alone in your false assertion that global warming is “accelerating”. That is because no one else, including Hansen and Lovelock, are willing to lie about it like you are. An American named Al Franken wrote a book titled Lying Lies, and the Liars Who Tell Them. He could well have been writing about Shehan. Pardon me Richard I misread your post. You do say it was you who was given time out as was I.
Mr Watts explained that the unending back and forth between you and myself was utterly tedious for everyone, moderators included. I entirely agree, but as long as you and Stealey are going to throw false and legally defamatory accusations against me I cannot let them slide. The University of Sydney found that out when I blew the whistle on a particular department, suffered the usual consequences and declined to “move on”. The more they threw at me the more I fought, successfully representing myself in court. I won one case, where false criminal charges were brought against me. After I tore them to shreds and presented independent witnesses to their perjury I won and the arresting police officer came up to me and shook my hand. I agreed to a draw in the other case after my accusers’ counsel pleaded for a truce. I had (again) caught them out lying under oath enough times to present the transcript to the Independent Commission Against Corruption (The judge congratulated me on my cross examination). The point became moot when the department I had complained about suddenly collapsed like a house of cards, the financial cupbord being found to be bare. So if you and Stealey think you can wear me down by unrelenting personal attacks and misrepresentations you have picked the wrong target. Much smarter and more powerful people and institutions have tried and failed. I write to ask you a simple question in hope of obtaining a simple answer (although I don’t anticipate anything other than long-winded irrelevance and evasion as your reply). Global temperature rise has reduced to be indistinguishable from zero for the last 16+ years. Using http://www.skepticalscience.com/trend.php to determine how long it has been that the global temperature trend is not different from zero at 95% confidence one obtains the following values from the different data sets. Warming is NOT significant for over the most recent 23 years. Warming is NOT significant for over the most recent 19 years. Warming is NOT significant for over the most recent 18 years. Warming is NOT significant for over the most recent 17 years. Please explain why you “don’t think” global warming has decelerated when global warming has reduced to be undetectable (at 95% confidence) by any measure since October 1995. Are you claiming there was not discernible global warming (at 95% confidence) in the twentieth century prior to October 1995? Shehan is dodging the issue again. And as predicted, he has cherry-picked very short-term time slots to show rising temperatures — but it is only cherry-picking like that, which supports his alarmist propaganda. I can easily do the same thing to show sharp declines in temperature, but I won’t, because it wouldn’t be honest. We all know that Shehan is claiming “accelerating” global temperatures for at least the past several decades — and more. But empirical observations falsify that nonsense. And as Shehan points out in so many words, his On/Off switch is wired around, you can’t turn him off, and he will never admit to the fact that for the past decade there has been no measurable global warming. Even his alarmist contingent now admits temperatures have been flat. I am surprised that you think your post addressed to me January 30, 2013 at 4:50 pm is an “apology”. Ooooh, now I am frightened. Do you think I should borrow your teddy bear? I have made no “personal attacks and misrepresentations” of you: I have merely objected to your lies. Richard: You may recall that in another thread I stated that there was no evidence of accelerating temperatures for the last 17 year period. I have also pointed out that given the noise and factors other than CO2 contributing to global temperatures, no 17 year period, still less an 8 year period, which Stealey has also presented, can be taken as representative of long term data. If you recall this discussion began with the presentation of a graph in a published paper showing temperature data from 1880 to 2007. Would you like to have a go at it or shall we simply call halt to this tiresome repetition of arguments before Mr Watts and the moderators again lose patience? What?! All this time you have never disputed that you claim global warming is accelerating. You even posted charts supposedly showing that. You never responded when I pointed out repeatedly that Hansen, Lovelock and others contradicted your position. So now, in an un-named thread, you are backtracking? Post a link to the comment you referred to, please. Because if you are now admitting that global warming has stopped for 17 years, you need to explain why you have been arguing incessantly to the contrary. You dunce. How many times do I have to write this? I have not been arguing about the last 17 years, the last or 16, or 15 or 8 because those short periods tell us nothing about what has happened since 1850 or 1880 to the present. With regard to your remarks about these graphs and the scientific method, remember how all this started? 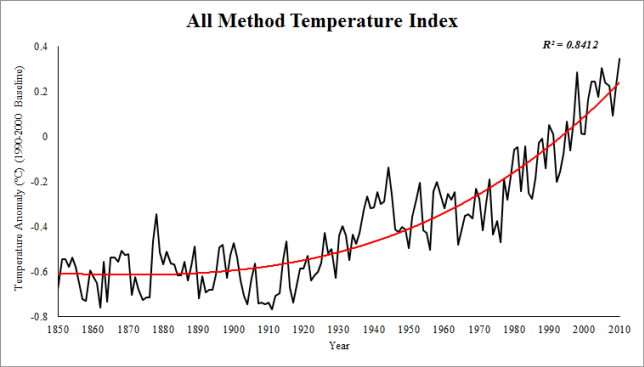 A published paper presents a graph of temperature data from 1880 to 2007 is and the authors claim that an “informal” eyeballing shows no acceleration in temperature. It does not look that way to me, so I added a linear fit to the data. Just as I expected, the early and later part of the data rises from the straight line. Not a good fit and indicative of acceleration of the data. No theory explaining the fit is involved here. It is an merely an observation of the dataobservation. The accelerating line is clearly a better fit to the data. Again this is a simple observation. No theory explaining the fit is involved. That comes next. Having made an observation the scientific method is to ask what theoretical explanation may explain this fit. And here is the thought that horrifies you so much he must deny that the temperature data is fit by a curve. Rising CO2 levels cause a rising temperature. This is still not a theory, it is only a hypothesis. Further detailed investigation aimed at establishing a theory must be explored and confirmed to reach that status. ∆T causes ∆CO2 — not vice versa. How do I know? Because you cannot show a similar chart showing that ∆CO2 causes ∆T. Go ahead, try to find one. Show me I am wrong. It will be a first. Wrong again, “scientist”. A hypothesis can be tested and falsified. AGW cannot. 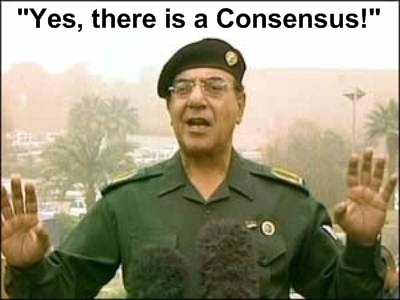 Therefore, AGW is only a conjecture. An opinion. So are you, or are you not, now admitting that there is no evidence of global warming accelerating for the past 17 years? It’s either/or, chump. I don’t anticipate anything other than long-winded irrelevance and evasion as your reply. My anticipation has proven to be correct. As “as scientist” you did that !? As a SCIENTIST? You fitted a curve that has no basis in reality or in physical theory but agrees with your prejudice of “acceleration”! And you have the temerity to claim you did that “as a scientist”! Then – without any reason or justification and in contravention of the facts – you claim your curve “is clearly a better fit to the data”. If your prejudice is right then measured temperatures should be tracking your curve. Your curve shows accelerating warming. Reality shows the warming has decelerated to be indistinguishable from zero over at least the most recent 17 years. And please note that an acceptable answer is NOT that you have generated a curve which fits your prejudice so empirical reality must be ignored and your unreal curve must be accepted.